Two years have passed since the first 14nm FinFET chips hit the market named Broadwell and for the first time ever Intel has taken a lot of time to develop the process to reach its maturity as Kaby Lake. With this, the company breaks its Tick-Tock release cycle by changing it to Process-Architecture-Optimization (PAO) so from now on it will take three generation to fully develop a process with the first one being the 14nm starting from Broadwell going through Skylake and reaching its final Kaby Lake optimization. 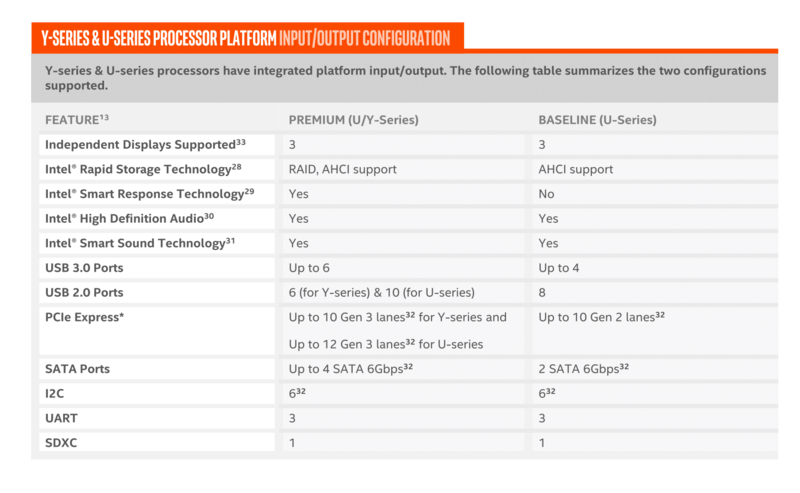 But what’s new in the Kaby Lake architecture? Essentially, the 7th Generation processors are going to be almost the same as the Skylake ones with some under the hood tweaks improving power consumption and performance by 12%, as Intel claims. 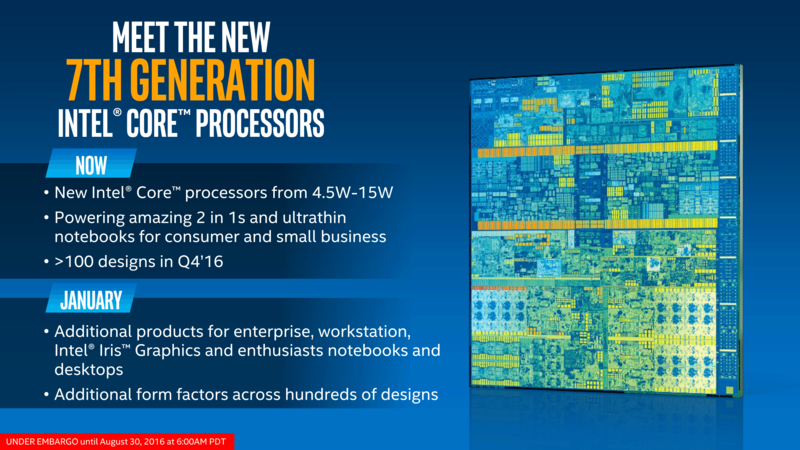 The name of the manufacturing process is now 14nm PLUS or 14nm+ and for now, Intel is giving away one key detail that differs from the previous Skylake generation. The new process has higher fin height and larger pitch allowing more breathing room for the already dense transistor lineup. In theory, this move should increase the power demand but the higher fin should compensate for that. Intel claims this will be enough for a few extra hundred MHz and will also improve the overclocking capabilities but we will know for sure when the first high-performance chips hit the market in January 2017. Moreover, Intel has implemented a better version of the so-called Speed Shift technology, which now allows even faster transition between frequencies and ultimately saving energy. We’ve talked about this feature in our Skylake review. Let’s get back to today’s announcements – the KBL-Y and KBL-U processors. The former represents the 4.5W chips that should cover the high-end tablets and 2-in-1 devices whereas the latter comes for the 15W notebooks. Both lineups will be available in mini PCs as well. And as rumored, the KBL-Y lineup will now feature Core i3, i5 and i7 parts dropping the Core m chips, although the Core m3 SoCs will still exist. The reason for this is that the Core i5 4.5W form factor performs just as good as the KBL-U i5 chips so the change in the marketing scheme kind of makes sense to clear out the confusion. For now, Intel released three KBL-Y chips – the Core i7-7Y75, Core i5-7Y54, and the Core m3-7Y30 with the first one offering exceptionally high burst frequencies up to 3.6 GHz, although it will mostly be up to the OEMs to determine how well these speeds will be utilized. As for the KBL-U chips, the manufacturer announced three of those – Core i7-7500U, Core i5-7200U and Core i3-7100U – successors to the Core i7-6500U, Core i5-6200U, and Core i3-6100U. Also, there aren’t any major changes in the supported technologies and the same features from the Skylake generation apply here. They are also shared by the KBL-Y chips as well. On the graphics front, the new iGPUs are branded as Intel HD Graphics 620 for the KBL-U and HD Graphics 615 having the same count of EUs (Execution Units). The GPU core is still Gen9 and doesn’t offer any major improvements over Skylake, except for the higher frequencies and overall better performance allowed by the 1 4nm+ process. But probably the most important feature about the new iGPUs is the revised media capabilities. Now the GPU’s revamped video processing blocks support full hardware acceleration for encoding and decoding 4K HEVC Main10 videos. While the Kaby Lake GPU can now handle the video processing alone, the Skylake iGPU was using a hybrid method that distributes the workload over the CPU and GPU’s media processor. 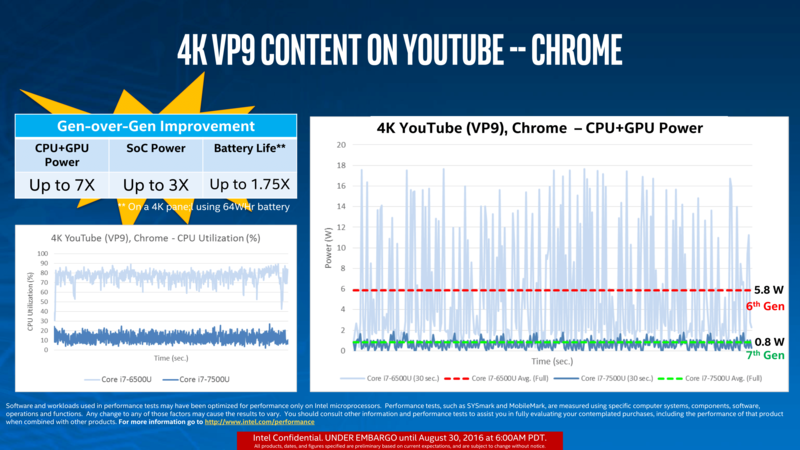 The change allows better battery life while taking care of more HEVC profiles. Of course, there’s a lot more to cover on the topic so expect more comprehensive analysis of the new Kaby Lake generation in the near future. We will also be waiting for the high-performance KBL-H lineup untill the end of this year and the desktop chips starting January 2017.